Declave: RollerForks® are fast, simple and reliable! Delcave has purchased RollerForks for unloading their containers fast and easily because of an increasing stream of goods that are being transported in containers. A good choice because it saves the logistic service industrial in wine and spirits a lot of time and also unhealthy handwork is avoided. “It is simple and perfect, think about it!” Koos Janssen, manager at Delcave from Doesburg enjoys the sight of RollerForks at work. A recently arrived transport ship is almost completely unloaded. 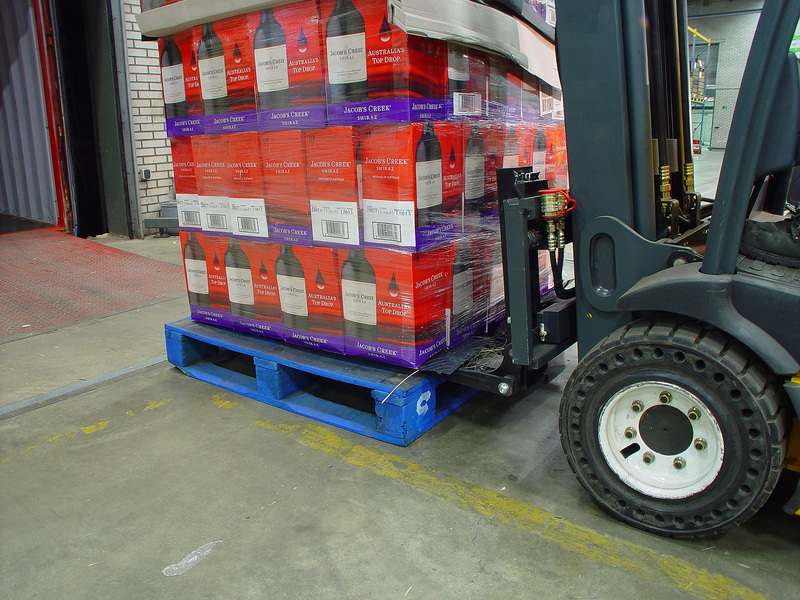 The lift truck driver places the “forks with rollers” (RollerForks®) under a load of Jacob’s Creek Chardonnay from Australia. As if helped by an invisible hand, the whole stack slides easily on the forks. As a distribution organisation for Pernod Ricard Holland, Delcave Services from Doesburg has taken care of the logistic services since a year. This production- and trade organisation imports exclusively for the Dutch market. Pernod imports various famous spirits like Sandeman Sherry from Spain and the sparkling Canei from Italy. Goods do not only come from Europe. Lots of strong liquids come from overseas. Whiskies from Scotland, Ireland and the US, wines from Australia and rum from Central-America. About 10 percent of the goods arrive in carefully loaded containers at the storage doors in Doesburg. “ These containers have to be emptied fast”, continues Koos Janssen while the last stack is rolling inside the storage room. “ If it takes longer than prescribed one even has to pay a surcharge.” Already at the first shipment Janssen and his six employees experienced that manual unloading was not a pleasant option. It is a tough job, ergonomically irresponsible and it just takes too much time. Only two men fit in a container, these two men needed at least 4 hours to unload whilst the permitted time is 2 hours. With the device “ it can be done faster and easier” Janssen started looking for a solution. The use of a push-pull system came up as a possibility, but it was soon forgotten when he ran into the RollerForks® at the Logistica fair in 2003. “ That system works 25 % faster and is more reliable than a push-pull unit,” says Janssen.” If you have got a bad slip-sheet without a lip you cannot do anything about it. Moreover investing in RollerForks is 50 % cheaper. This is also an important issue.” After being accustomed to the RollerForks in the beginning, they have been used successfully for almost a year now. The forks have been mounted on an electric four-wheeler made by Jungheinrich. It can drive inside a containers without any problems because of its height. 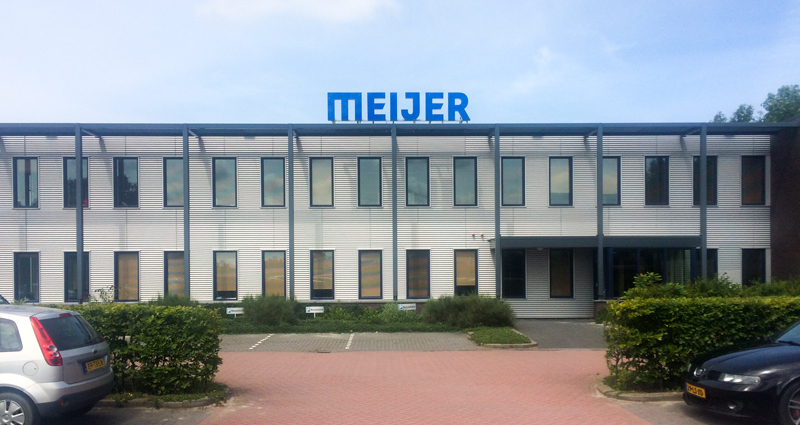 Rollerforks® are developed by Meijer Handling Solutions from St. Jacobiparochie. The new product was introduced at the Logistica fair in 2003. It immediately received the Logistica Award. A few months later it also won the Innovation Award from the Metal Union. The principle of the Rollerforks is as simple as ingenious. Rollerforks® are in fact standard lift truck forks with two layers of rollers. When the undermost rollers touch the floor they cause the uppermost rollers to rotate in the opposite direction. In this way a load is easily placed on the forks. Unloading works exactly the same, only in the opposite loading order.